If you want rougher effects like distortion, gravel and grit you don’t have to drink Bourbon and smoke cigars everyday to get the rough sounds you want! The good news is that science is starting to support the view that most vocal effects occur as vibrations away from the vocal folds and that vocal damage is not limited to those choosing to use effects. Many other factors come into play such as technique, volume. lifestyle and ‘robustness’ of voice which are dangers to all singers, not just singers using effects. Vocal effects are a ‘primal’ part of all of us that we are born with, so on this weekend, we will explore tools and tricks to help you tap into sounds that are already within and go beyond CVT to more extreme techniques. 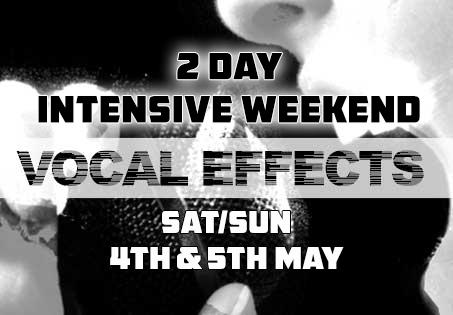 So if you want to take your vocal expression and unique sound to the next level – why not consider a vocal effects weekender in London? All teachers and guest tutors are rock and metal professionals or regularly perform using rough effects so can demonstrate all effects live to a high standard. Pre Requisites: A knowledge of the vocal mechanism and voice technique is useful but not essential as we will take you through the basics of good setup and technique to start using effects. If you have had no vocal training at all, you can always take an intro to CVT workshop before the course. Discounts are available for those taking both courses. Tuva – what is it – can you find it? Combining Effects – the Holy Grail of effects! Please note – This is an intensive course intended as an intense introduction to extended techniques from beginner to advanced. If we feel that a singer needs more work on vocal technique before using certain effects, we may advise you to stop if we feel that it may be harmful for your voice. Vocal health is paramount, especially when using effects live so it is very important to ensure your technique is correct! Cancellation Policy – if cancelled 3 + weeks in advance a full refund will be given minus a £25 admin fee. Within 2 weeks 10% of the course fee will be retained plus a £25 admin fee, Within 1 week 25% of the course fee will be retained plus a £25 admin fee. If cancelled within 48 hours 50% of the course fee will be retained. If cancelled within 24 hours 100% of the course fee wlll be retained – however you may be given the opportunity to book on another course in exceptional circumstances. There are limited places for additional after hours lessons on the day of the workshop from our Shoreditch Studios. Should you wish to partake in a 1 to 1 lesson, we can offer a discount course participant price of £30 for 30 minutes or £45 for 60 minutes. Lessons will take place from 6 pm – 10pm after the workshop with 30-60 minute slots available. Calendar will be proivded on booking. London - 1 on 1 singing lessons from our Shoreditch Studios - £25 (30 mins) / £45 (60 mins) - for workshop participants during the course of a workshop.